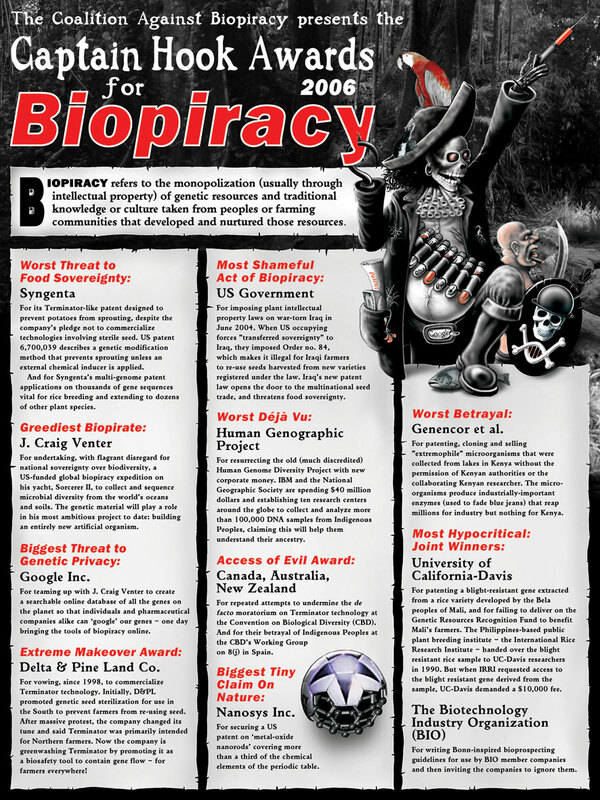 The Captain Hook Awards, awarded by the Coalition Against Biopiracy, are held at the meeting of the CBD's COP to draw international attention to the Convention's failure to provide meaningful regulations to stop biopiracy - the monopolization of genetic resources and knowledge taken from the farming communities and peoples that have developed and nurtured those resources. The Captain Hook (and Cog) Awards ceremony takes place every two years. In 2006 they were announced at the COP8 in Curitiba Brazil, in 2004 at COP7 in Kuala Lumpur, Malaysia, 2002 at COP6 in The Hague and in 2000 at COP5 in Nairobi. The Coalition Against Biopiracy is an informal group of civil society and peoples' organizations that first came together at the 1995 Conference of the Parties to the Convention on Biological Diversity meeting in Jakarta. More information about the coalition can be found here. Here are the posters for each of the Captain Hook and Cog Awards to date. The poster can also be found here.